People come to visit Playa Nicuesa Rainforest Lodge in Costa Rica for its pristine tropical beach, beautiful rainforest, and jade green Pacific Ocean so clear you can see to the bottom. Costa Ricaâ€™s cleanest beaches. The undertaking is definitely worth it, given that this region of southern Costa Rica is a giant conservation area that includes the world-famous Corcovado National Park on the Osa Peninsula, the Piedras Blancas National Park and three other private reserves. The unique Golfo Dulce â€" â€œSweet Gulfâ€ â€" is a critical habitat for migrating Pacific Humpback Whales, and dolphins and sea turtles. â€œWe are proud to say that Playa Nicuesa is a very clean beach, where our guests can enjoy it without any danger. We constantly hold beach cleanups to keep our beach clean,â€ said Natalia Solis, Sustainability Coordinator at Playa Nicuesa Rainforest Lodge. This is the fifth time Nicuesa Lodge has been awarded the Blue Flag. 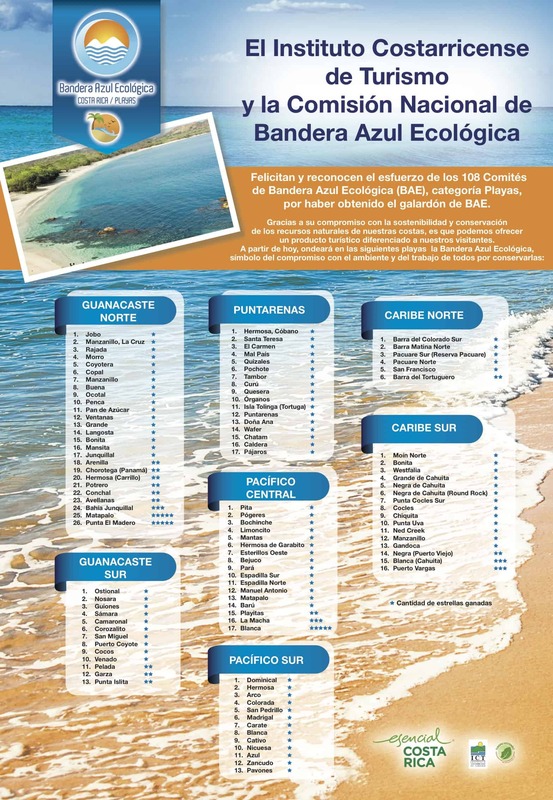 Costa Ricaâ€™s Blue Flag Ecological Program (Bandera Azul EcolÃ³gica) was launched nearly 20 years ago in 1996. Its goal is to protect the countryâ€™s diverse and fragile coastal ecosystems; to clean up beach pollution and prevent future pollution; to improve the health of Costa Ricaâ€™s people and environment; and to keep Costa Rica as a leading world ecotourism destination. The prestigious certification is granted every year and is coordinated by the Costa Rican Tourism Board (ICT), the National Chamber of Tourism (CANATUR), the Costa Rican Water and Sewage Department (AyA), the Ministry of Environment (MINAE), the Ministry of Public Health (MINSA), and the Ministry of Education (ME). Beach cleanups every four to six weeks by staff and guests. Maintain five trash receptacles near the beach at Playa Nicuesa. Work with the Costa Rica Health Ministry campaign against dengue fever in the region. Hold workshops on environmental issues. Test the hotelâ€™s potable water at least every three months to ensure its safe drinkability. Test the ocean water at Playa Nicuesa twice a year. Reforestation with native Costa Rican tree species to create a biological corridor. Playa Nicuesa Rainforest Lodge The extraordinary Costa Rica eco-lodge was designed in harmony with the environment constructed from naturally fallen trees and recycled materials. A true Costa Rica rainforest lodge, Nicuesa Lodge is located on a 165-acre private rainforest preserve. Being a unique adventure travel destination, the only way to get there is by boat across the pristine waters of the Golfo Dulce from either Golfito or Puerto Jimenez.